It's 2065, but retired computer programmer James finds himself transported back in time 500 years. Suddenly he is living the life of a 10 year old Indian child named Baby Bird. His life is flipped upside down once he is taken away by an uncle he has never met to a village where he is not easily accepted. Here he must learn to build canoes alongside his uncle while keeping ideas and concepts from the future-his own time-secret. With the help of his uncle, two quiet sisters, an old man, and his new friend Phoenix, Baby Bird slowly finds his place his new home with a few challenges and adventures along the way, including the ceremonial ritual to become a man. Will Baby Bird find his way back to his own village, and will James return back to 2065? 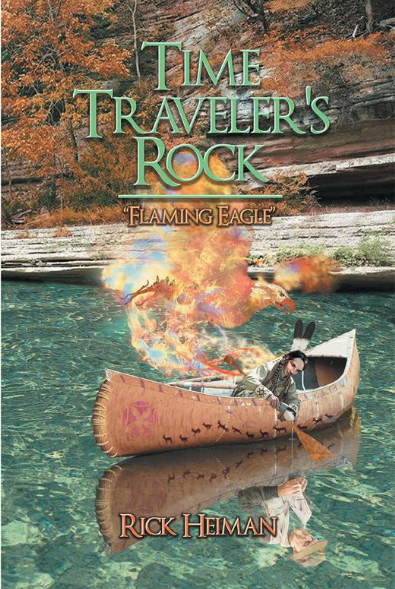 Time Traveler's Rock: Flaming Eagle is a story that weaves the past and future together with action and adventure, drawing in children and young adult readers. 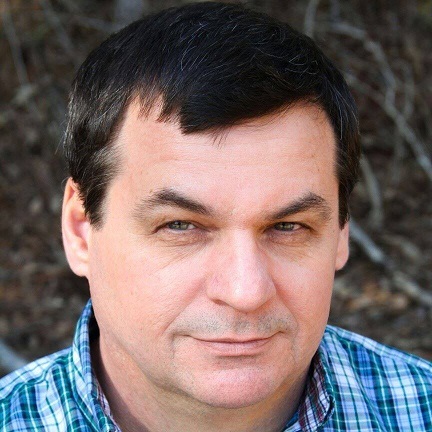 Rick Heiman started working in law enforcement in 1988 and has spent countless hours writing police reports. In 2000 he started writing fiction but was slow to start until the Time Traveler's Rock series came to him in a dream and the story practically wrote itself. Time Traveler's Rock: Flaming Eagle is a unique title of it's kind. As an outdoor enthusiast myself, I really enjoyed jumping into a story where I was transported into wilderness living. The protagonist, James, is a retired computer programmer who sets off on a hike one day. While stopping to rest, James falls asleep and wakes up to different scenery than what he recalls dozing off to. He comes into confrontation with a young boy speaking a different language, and is then shoved with such force, he falls and strikes his head on a rock. James blacks out. Suddenly, we are seeing the story through the eyes of a young American-Indian boy named Baby Bird...and we are transported back 500 years. He is taken from his family and forced to live with a Canoe Man. Baby Bird is exposed to many facets of growing up, such as hard work, bullying, sportsmanship, and responsibility. The reader grows right along side him. There is a strong theme of growth in this book. It has a very interesting premise and I thought it had a well developed plot that moved at a satisfactory pace. There are just enough plot points and surprise turns to keep your interest from dwindling. The book itself is a time machine, and I found it intriguing that we traveled from the future to the past in one sitting! Cons are: I wish there was a little more development around how the time traveling happened and why; that seemed a little unclear to me. I also think there needs to be a little more grammatical cleanup in terms of punctuation and sentence structure. Overall, this was an enjoyable book! It has a lot of potential and I think it would do well in the library. Special thanks to Rick for supplying me an ecopy of his book, it was a pleasure meeting him at the Southern Festival of Books in Nashville!